Denmark is set once again to be inundated with Olympic medallists and World champions, as next week racing starts at the 470 World Championship, off Rungsted Harbour. The start gun for the opening races, to be held off the harbour, 25km north of Copenhagen, will be on Sunday, 23 August, culminating in medal races for the Men’s and Women’s fleets on Saturday, 29 August. A fiercesome line-up is expected. In the Men’s division, Skandia Team GBR’s Nic Asher and Elliot Willis return to defend their title, won at Sail Melbourne last year by a slender 0.8 points from Portugal’s Alvaro Marinho and Miguel Nunes. The duo were also World Champions in the class in 2006. 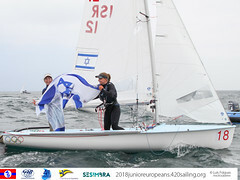 In the men’s fleet 99 boats are currently entered from 29 countries, from afar afield as Australia, New Zealand and Japan, to smaller nations such as Belarus, indicating once again the egalitarian nature of the 470; an affordable boat designed to entice every nation into Olympic sailing. The largest entry is from Italy, fielding ten boats, closely followed by Team GBR on nine, then France and Spain, both with eight. The Danish hosts have five. The men’s line-up, features crew from all the medalling teams at last year’s Beijing Olympics, interestingly all sailing at this 2009 World Championship with different crew: Australian Gold medallist Malcolm Page has a new helm in the form of Matthew Belcher; silver medallist, Team GBR’s Nick Rogers now has Pom Green as crew; Nicolas Charbonnier, who returned to France with bronze last year is now sailing with Baptiste Meyer. In the women’s class, 57 teams are currently signed up, from 23 nations. 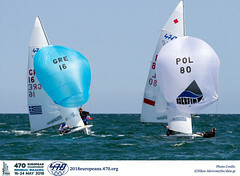 Among them, the US Sailing Team Alphagraphics’ 2008 World Champions are returning to defend their title, but, compared to Asher and Willis, Erin Maxwell and Isabelle Kinsolving are less bullish about their chances. Like the male 2008 World Champions they didn’t get to represent the USA in Beijing and so have taken some time out. As to the Beijing Olympic medalists in the women’s fleet, the Australia duo of Elise Rechichi and Tessa Parkinson will be competing, but like Maxwell and Kinsolving, they have had a break and this will be their first major regatta since the Games. Dutch silver medallist Lobke Berkhout returns but with a new helm, Lisa Westerhof taking over from Marcelien de Koning. 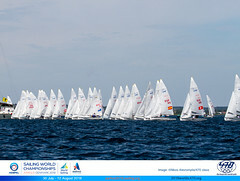 The 2009 470 World Championship is one of a number of high profile sailing regattas taking place in Denmark this summer as part of wider festival of different sports, called Denmark’s Year of Sport. To do their utmost to ensure that their events are held to the highest possible standards the Danish Sailing Association is working with the support of the insurance company CODAN (part of Sun Alliance Group), to provide TracTrac tracking during the Laser Radial Europeans, Finn Gold Cup, EUROSAF Match Racing Europeans and 470 World Championship. The Danish Sailing Association has purchased 150 state-of-the-art GPS tracking devices, allowing races to be followed in real time over the internet. Last year the TracTrac tracking of the ISAF Youth Sailing World Championship in Aarhus, Denmark was followed by nearly 30,000 viewers from 69 countries all over the world.